Any health certificates needed for travel will be your expense. ~$75 is what our vet charges. Great, stout ewe lamb. 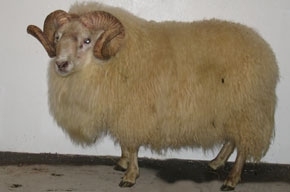 Wonderful fleece and milky lines form the sire's side. Long bodied, fast growing ram lamb, great build, out of very milky lines, carries moorit. Breve is a two winter ewe who surprised me with how much milk she had this year. She had no problems birthing this large ewe lamb and is a very protective mother.